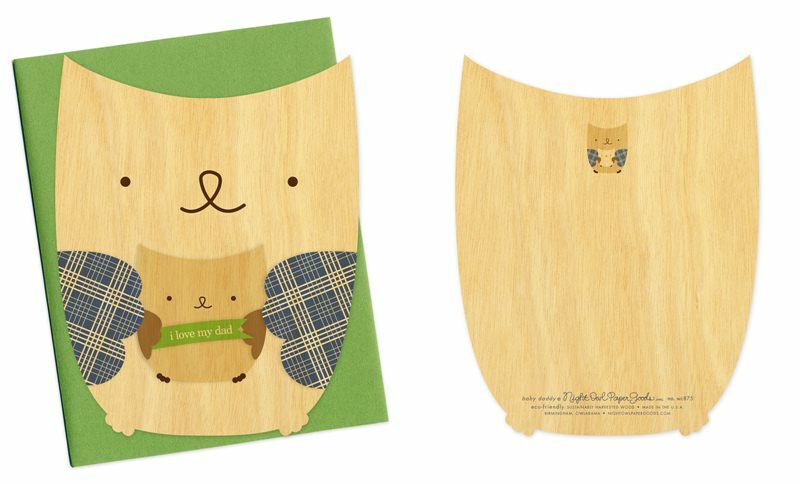 We’re already big fans of Night Owl Paper Goods, and now they can help you celebrate dad on this year’s Father’s Day (June 17, 2012). Night Owl Paper Goods offers some truly sweet Father’s Day cards this year, many that are well worth framing and keeping forever, like the adorable Monkey Vines card shown above. The Monkey Vines card is made in the USA from sustainably-harvested birch wood you can actually write on with color pencils, ballpoint or gel pens and is 100% biodegradable and recyclable to boot. Plus, because these are wooden, no two cards are alike, emphasizing the uniqueness of your own little one’s dad. There are many other wooden card choices to pick from and some paper cards made from 100% reclaimed & recycled cotton. We're already big fans of Night Owl Paper Goods, and now they can help you celebrate dad on this year's Father's Day (June 17, 2012). Night Owl Paper Goods offers some truly sweet Father's Day cards this year, many that are well worth framing and keeping forever, like the adorable Monkey Vines card shown above. The Monkey Vines card is made in the USA from sustainably-harvested birch wood you can actually write on with color pencils, ballpoint or gel pens and is 100% biodegradable and recyclable to boot. Plus, because these are wooden, no two cards are alike, emphasizing the uniqueness of your own little one's dad. There are many other wooden card choices to pick from and some paper cards made from 100% reclaimed & recycled cotton.